W3C is pleased to announce its latest online training course: Introduction to Mobile Web and Application Best Practices. The course will start on 6 June 2011. This represents a substantial revision of the popular course that ran several times between 2008 and 2010 and includes a lot of new material concerning Web applications. Delivered online over 8 weeks, the course will help Web designers and content producers who are already familiar with the desktop world to become familiar with the Web as delivered on mobile devices. It is based entirely on W3C standards, particularly the Mobile Web Best Practices and Mobile Web Application Best Practices. learn about and use the exciting new APIs available on modern mobile platforms. The course will be taught by Phil Archer who was a member of the Mobile Web Best Practices Working Group from the outset. Phil is an acknowledged contributor to many W3C Recommendations related to mobile and gained praise from participants in the earlier course for his enthusiasm and subject knowledge. The second early bird period runs until Friday 20 May at €145. Please find full details of the course and register now! 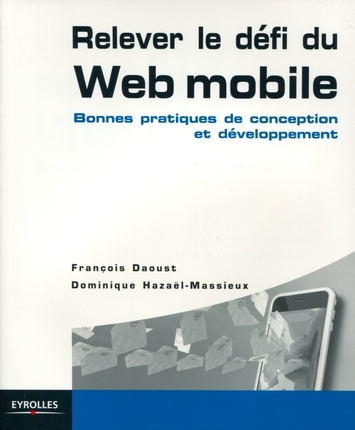 Two of the MobiWebApp project participants, François Daoust and Dominique Hazaël-Massieux have written a book in French, titled Relever le défi du Web mobile (taking up the mobile Web challenge) on mobile Web design and development that has just been released today. Find out more on the book on its accompanying Web site. Let us take this as an opportunity to give our best wishes to our readers! Welcome to the MobiWebApp Web site! The Mobile Web Appications EU project has just started on 1st September 2010. We will post regular news about the work, our participation in related events, new communication material, training courses and more. Most of the MobiWebApp staff will be present at the ICT 2010 event in Brussels, end of this month. Do not hesitate to contact us in advance and on site for possible further collaboration and coordination work.